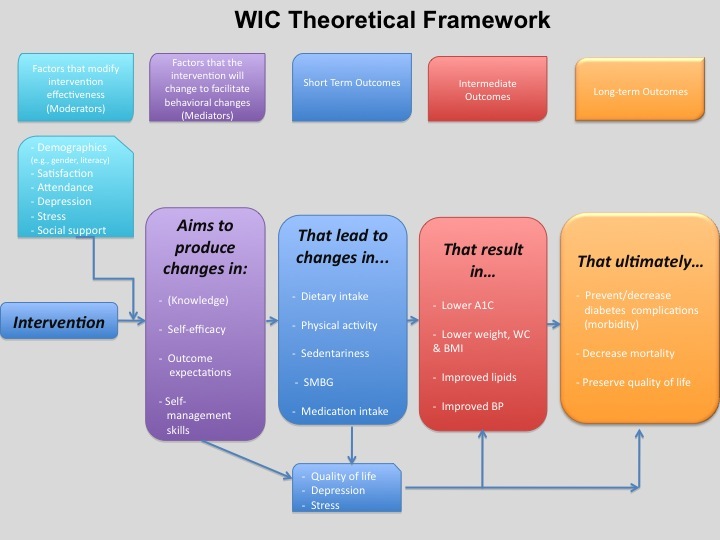 This graphic is the theoretical framework for our NIH-funded Women in Control project. I’ve blogged about this project previously here and here, but to briefly recap, this is a health behaviors program intended for African-American women with uncontrolled type 2 diabetes mellitus (T2DM). We are currently recruiting 120 T2DM patients in the Boston area as study participants. Half the subjects will participate in the health education program in traditional, face-to-face sessions conducted at Boston Medical Center while the other half will participate in the same curriculum from the comfort of their own homes, in the virtual world of Second Life. All study participants will be given a laptop computer and those in the virtual world experimental group will receive hands-on training to familiarize them with Second Life. Will subjects in the virtual world program demonstrate greater impact at study-end on health behaviors than subjects in the real world, as measured by patient activity levels: calories consumed; adherence to prescribed medication regime; and decrease trends in overall disease indicators (hemoglobin a1c values, body mass, LDL, and blood pressure)? For the last six months, the project team has been building the curriculum, planning (and building) the Second Life activities, refining the materials, plotting the recruitment procedures, and clarifying the desired outcomes for the intervention. The “intervention” consists of 3 individual sessions and 8 groups sessions for the subjects led by diabetes educators. The intent is to produce changes in internal factors that lead to changes in behaviors and psychological states for the subjects. The eventual, hoped-for results will be physiological improvements that ultimately lead to improved overall health and quality of life. The diagram shown at the top of this post provides the theoretical overview of what we hope to accomplish. The tourqouise-colored box shows the factors that could modify the intervention’s impact (e.g. low literacy levels). The purple box displays the variables that the intervention will attempt to modify. While we can’t make people eat more healthily or take their medications regularly, we can use tools and techniques that have been shown to help people change their behavior. The techniques we will use in this study are motivational interviewing, active learning, and the dynamics of group work. It is our hope that these methods will help the subjects take small steps toward greater self-management of their disease. Last week we conducted a pilot Second Life training with two “test” subjects for our forthcoming health behaviors study, to be conducted in the virtual world of Second Life. I’ve blogged about this project in an earlier post. In a nutshell, this is an NIH-funded health behaviors study with African-American women who have uncontrolled diabetes type 2. The project team has finalized the curriculum, set out a plan for subject recruitment and secured the IRB approval. 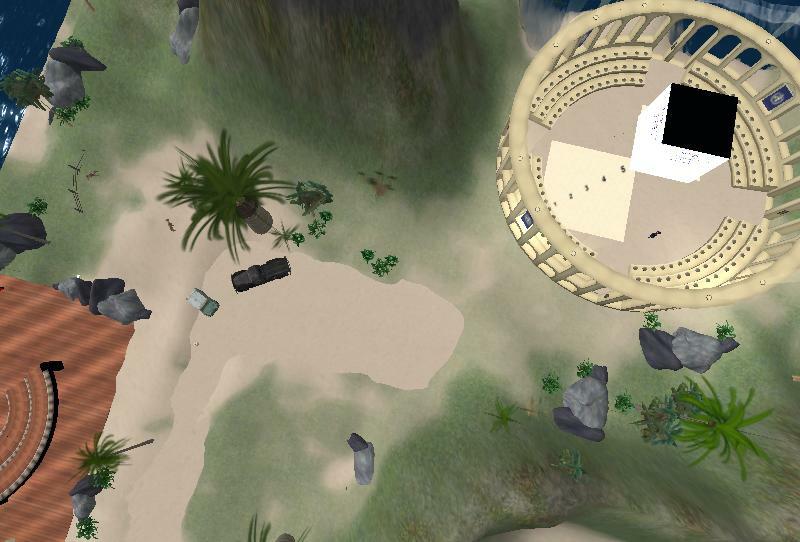 My part of the project is everything to do with the subject cohort who will experience the program in Second Life. 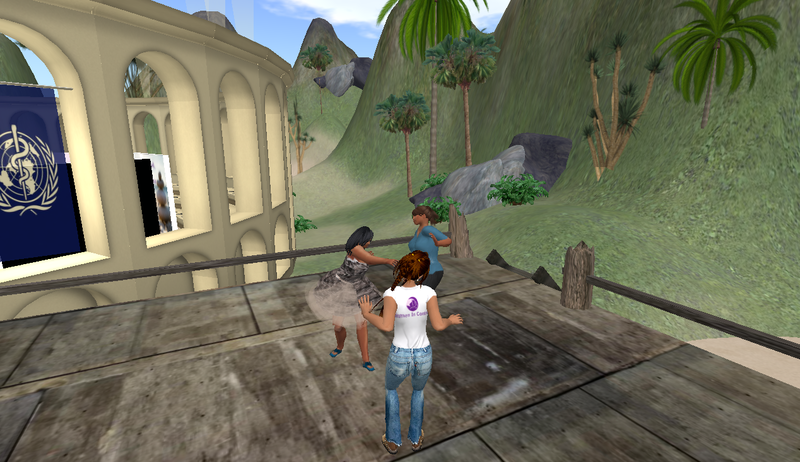 To that end, in anticipation of the program’s start in May, we have built out the Second Life space (shown above), trained all of the educators, designed Second Life activities, and designed an SL orientation for the subjects. It was that orientation that we tested last week. the basics. Their orientation consists of two, two-hour in-person sessions. The first one is an orientation to the laptops and the wireless modem they will use for the program (Macbook laptops and Verizon USB modem devices). At the conclusion of that first session, I take them into Second Life in what I’m thinking of as a passive, “first-look” view. I projected my computer onto the room’s media screen, dimmed the lights, and encouraged them to just sit back and enjoy. I logged into SL and introduced them to Spiral Theas, my avatar. She waved. They gasped. We left them there – with lots of questions and anticipation. 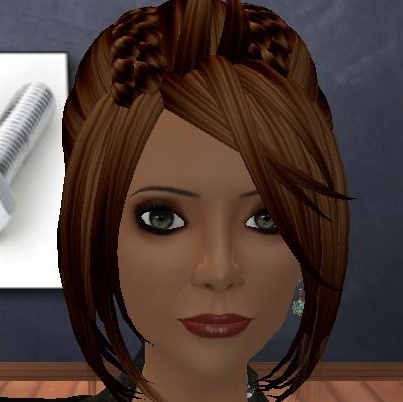 The next two-hour session, held three days later, was going to be all about Second Life. They came in, hooked up their laptops, and fired them up. Without too much trouble, they all got in-world and met their avatars (that we’d prepared for them in advance). They walked, ran, danced, and sat down. We went over how to chat, how to speak (fiddled with headsets). We opened the map (“oooh, it’s like looking down at the world from a plane!”). We opened their inventory (“where are my clothes?”). We teleported to another location. It all went so much more smoothly than we thought it would. They were excited, interested, and not at all intimidated by the interface or the complexity. There were some confounding gaps in their computer knowledge that tripped me up. Here’s one that took us by surprise: When we were using local chat to send messages to each other, one of the subject’s messages appeared with no spaces between the words. She asked me how did I get the spaces between the words and I explained that you just hit the space bar when you finished typing a word in order to advance one blank space and type the next word. “Where’s the space bar?”. Another had to do with physical orientation to the space. I had thought that a projection of my laptop to the front of the room would help them – if they got lost as to what to do, they could look up on the big screen and I could demonstrate. Instead, they kept referring to the big screen over their own, smaller screen and getting very confused about their “view”. After a few minutes of this confusion, I disconnected my laptop. They were then able to focus on their own screens and seemed relieved. Less to manage. The navigational task that they found the most challenging were (not surprisingly) controlling their camera view. We made a program decision to not have a mouse with the computers and rely instead on the track pad. We figured that since these subjects did not have much in the way of computer experience, learning to use a mouse would be just as much of a task as learning to use a track pad and then we’d have one less appliance to worry about. The track pad is a bit tricky (one finger or two? swipe or drag?) but the element that caught me by surprise was that one of the subjects had longish fingernails and it was much harder for her to use because of them.